Discover How YOU Can Become a LIFE COACH – TODAY! Just By Motivating People to Achieve Their Dreams! Help others, help yourself – and earn a fortune! There’s no doubt about it: Life coaching is a dream job. You spend your time creating success in the world. Helping others achieve their dreams, their desires, their goals. You become the motivational individual EVERYONE wants to speak to, helping your clients move forward in their career, business and relationships. You help others -- and a result, help YOURSELF in your own development too. And the career prospects? Well, you only have to commute to your HOME OFFICE – and can easily earn up to a staggering $300,000 a year, working anywhere in the world. Isn’t THAT something you at least want to LEARN MORE about? THOUSANDS of People Search for Life Coaches, EVERY DAY! Here’s How YOU Can Get Started in the Life Coaching World! Life coaching is all about helping people achieve their goals. Every single day, thousands of people search Google for life coaches the world over, to help bring greater structure and direction to their lives. From young professionals to work-at-home moms, EVERYONE wants a life coach. They're individuals that provide guidance and motivation to help clients achieve their goals. Life coaches help their clients lose weight, rocket their confidence, boost their business, kick that bad habit – and more. They use special techniques and methods to help clients change their ways. And it’s all usually done over the telephone, typically via a half-hour session each week. Trust me: It is EASY. ANYONE can be a life coach. But MOST life coaches NEVER get started. Why? Because most life coach training COURSES cost THOUSANDS to sit. And they don’t share the TRUE SECRETS behind real-life coaching. Finding the right life coaching course at the right price is literally IMPOSSIBLE. LIFE COACHING is the Only TRUE Booming Market Today! - Working Part-Time, Turning Over $300k, On the Phone! I’m Bradley Thompson – and welcome to this site! I’m president of the Advanced Life Coaching Institute, and one of the world’s best-selling self-help authors. I helped develop courses such as Happiness Now, the NLP Secret, the Life Makeover system, and many others. I’ve made literally millions of dollars in the self-help industry, and know just what people are looking for. And RIGHT NOW... People are looking for personal LIFE COACHES. They no longer want to read books offering generic guidance. They don’t want to listen to a hypnosis session telling them how to live their lives. They want a human being to set them straight... to provide motivation... to monitor them... to be accountable to... to guide them through life’s many twists and turns. A human being... like YOU. Trust me: life coaching is a breeze. I’ve been doing it now for over 20 years. In recent times, I expanded it with my teaching business too, and began earning over $300,000 every single year – as SUPPLEMENTARY INCOME to my regular work. Today, the market is even bigger, and the opportunities more vast. It’s the only truly booming industry in the western world. EVERYBODY wants a life coach. And this is YOUR time to get started! Discover the ULTIMATE Life Coaching Training Program! I know EVERYTHING there is to know about life coaching. I know how to QUICKLY and EASILY attract new clients. I know precisely HOW MUCH to charge for your sessions. I know the TRICKS you’ll need to know to quickly INSPIRE CHANGE inside anyone. I know the niche markets which pay the biggest bucks. I know of the problem areas, such as boundaries and malpractice. I know how you can use your skills to quickly get featured on TV, radio and the Internet. Not only that, I know PRECISELY how you can get started in life coaching – and begin earning up to $300,000 every single year, FROM DAY ONE. That’s why I’ve spent the past year creating the ultimate, advanced life coaching course. It’s a three-week, part-time training package that will take you from zero to hero in just a few short hours – and give you ALL the skills and tools you need to become the best damn coach in town. Not only that, the package also includes a diploma, bonus Q&A audio session, duplication rights for our happiness book and digital program, 24/7 life coaching support, a one-year guarantee, and much more. The name of this amazing course? Take a SNEAK PEEK Inside the Life Coaching Secrets Program! From Sample Contracts & Scripts, to Marketing & Much More! Life Coaching Secrets is the ultimate course in becoming a life coach. It provides EVERYTHING you need to get started: from the scripts you can use, to the client techniques you must know, to the business marketing plans, to actual products you can give to help motivate your clients. The main “Life Coaching Secrets” course is split into three 70+ page instalments, each designed to be devoured part-time over the course of a week. It’ll take you about half-an-hour a day. In under a month, you’ll be able to use this information to become a fantastic life coach – and begin earning up to (and over!) $300,000 every single year. And you could even be working at home, in your pyjamas! Interested? Let’s take a sneak peek inside the course. How to get started in the FASTEST-GROWING industry around – More people are demanding life coaches. Here’s how to make yourself #1! How to attract the VERY BEST clients around – From big buck professionals to young entrepreneurs, you’ll learn how to get the pick of the litter! The BIGGEST advantages of being a life coach – Including being your own boss, setting your hours, earning $$$$, and putting your skills to great use! What to do THE MOMENT a client first contacts you – We’ll give you exactly what you need, ranging from welcome pack information to a fee schedule! EXACTLY what your life coaching sessions will involve – It’s easier than you think. We’ll give you the techniques, strategies and SCRIPTS to help! How to charge $600/£400 per client, PER MONTH – That’s ~$150 per weekly half-hour telephone session (very reasonable!) – well over $300,000 PER YEAR! The SEVEN THINGS you must NEVER do in a session – Make sure you pay attention to these no-no’s, or you’ll have clients dropping like flies! The SIXTEEN QUALTIES you MUST have as a life coach – And don’t worry if you don’t naturally have these, we’ll show you the BEST way to get ‘em! From TELE-COACHING to one-on-one sessions – Here’s how to act in each situation, and the tips you need to maximize on your results! Understanding BELIEFS and SELF-TALK – Why these are super-important, and how to change them in your client, using our secret techniques! How to separate PERSONAL stuff from BUSINESS stuff – Sometimes life will get in the way of your coaching. Here’s how to stop it! How a CRISIS MANAGEMENT PLAN works, and why you MUST have one – This is absolutely critical, and it happens to every life coach - so prepare! Mission Statements, Promise Statements, and MORE – What they mean for you and your client, and how to give them POWER! The SEVEN SECRET TIPS for being a LIFE COACH PRO! – It’s EASY, and nowhere near as difficult as most people think. Follow these tips for success! The ULTIMATE CHECKLIST for your life coaching business – Tick the boxes to ensure you know PRECISELY what you’re doing! Every single SECRET COACHING TOOL you’ll ever need! – Just dip into your virtual toolbox and uncover the little-known techniques for helping your client! How to clear OBSTACLES in your clients mind! – They constantly crop up. Learn how to clear them immediately – great for personal use, too! The 14 MOST COMMON obstacles, and how to handle them – Specific, tailor-made solutions for “big problems” in your clients life, and how to eliminate ‘em! How to undertake a FULL LIFE AUDIT for your client – And yourself, too! Here’s the simple Life Assessment form to complete. Just print and fill out! How to PREPARE for your VERY FIRST coaching session – Here’s what you’ll need to hand, and the work you’ll need to do just before. It’s SIMPLE! Emergency questions for ANY SITUATION! – You’ll never feel lost with these questions. Read them out at any time and you’ll find instant assistance! The SEVEN LITTLE-KNOWN TRICKS for achieving great results with clients – Just follow these methods for fantastic results and returning clients! How to graduate from basic to PROFESSIONAL LIFE COACH – Here’s the route you’ll need to take, and the business tools you’ll need to understand! EIGHT guerrilla marketing techniques to DOMINATE your market – Here are the sneaky tools you need to ensure you become a leader in your life coaching market! The SECRET to gaining FREE press coverage! – The press love and great story, and here are the simple and easy tricks for creating one. INSTANTLY! How to BRANCH OUT from being “just” a life coach – Become a public speaker, TV/radio expert, best-selling author, workshop host – we show you how! Why being a NICHE COACH can earn you even more $$$$ - And the precise steps you need to take to become one. PLUS, check out out top niche markets! How to create LONGER-TERM SUCCESS beyond just life coaching – From membership sites to coaching courses, referral programs to partnerships! Are YOU ready to discover more about becoming a life coach? Wouldn’t your life improve just by READING this material? And can you imagine if you even decided to put just SOME of it into practice? Remember, these are the SECRETS of the life coach. The tricks and techniques the motivators use to help in YOUR life... not the usual rubbish you find in self-help books littering Amazon. PLUS: Claim Your Advanced Life Coaching Institute DIPLOMA! Simply Sit Our Course And We’ll Honour Your Achievements! Simply sit this course – and receive your full life coaching diploma! 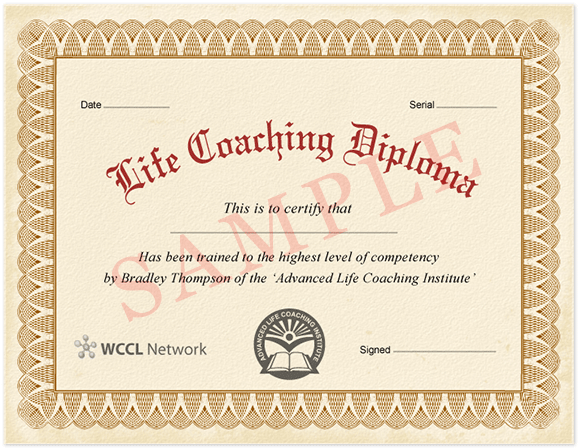 Would you like to hang your own professional life coaching certificate up, proud of your achievements? A certificate from the Advanced Life Coaching Institute, stating that you received direct tuition from Bradley Thompson, and signed by the man himself. Well – it’s yours – FREE. You don’t need to do anything special. We’ll handle it all for you. We’ll send everything alongside your purchase. BONUS: Grab My FREE 45-Page Life Coaching EXPOSE! - Including How to Change Emotional States in MINUTES! Order TODAY – and I’ll include my own FREE 45-page BONUS life coaching module! I’ve prepared a special bonus guide, which sits perfectly alongside the Life Coaching Secrets course. It’s called “More Life Coaching Secrets!” – and it’s my exposé of the TOP SECRET life-changing techniques usually hidden by the industry experts. Inside the guide, you’ll learn about the HIDDEN TRUTH behind “words”. You’ll uncover client-coach conversations for changing emotional states, setting intentions, turning the negative into positive. You’ll find EXAMPLE SCRIPTS which you can swipe STRAIGHT out of my mouth! This bonus module will TRULY blow you away. And it’s YOURS. For FREE. When you order TODAY. SUPER BONUS: Full Rights to Best-Selling HAPPINESS Book & digital program! ... By Giving Away FREE Copies of This POWERFUL New Book! This is perhaps the BIGGEST BONUS you’ll ever stumble across! In addition to the main course, the diploma, and the bonus guide, I’m offering you FREE rights to an e-book and audio recording combination – that YOU can give straight to your clients! “The 18 Rules of Happiness” is a best-selling book by self-development leader, Karl Moore. You can buy it in both book and audio CD, right now at Amazon. When you purchase the course, you’ll receive rights to give away UNLIMITED COPIES of both the e-book version AND the audio version (in MP3 or CD format) to your clients! Give copies of the book away as an incentive to join your newsletter. Or issue it to clients as required reading, to help boost their happiness during their work with you. It’s the PERFECT COMPLEMENT to your life coaching work – and you won’t have to pay a SINGLE PENNY on royalties or printing fees to use it! Most people pay more than the cost of this entire course JUST to purchase Karl’s book and audio CD. You’re getting the FULL RIGHTS to redistribute – with NO royalties – to anyone you desire, to help promote your own life coaching business. Nobody else IN THE WORLD offers this. But ONLY when you purchase before MIDNIGHT, April, 21st. Get Started in the World of LIFE COACHING – TODAY! Program Available...Delivered via Digital Download so you can get started TODAY! Are YOU ready to learn more about the world of life coaching? You’ll discover the MASTER TOOLS that life coaches use to change somebody’s world. You’ll find out how to become a professional life coach, and feel great about your work. And you’ll uncover a potential new career, allowing you to both work from home (if you desire) – and earn up to a cool $300,000 a year, simply by helping others! Surely it’s worth a few dollars to find out more? Well – with the full three-week life coaching course, the diploma, the bonus audio, and the rights to “The 18 Rules of Happiness” – you’d expect this entire package to cost THOUSANDS. If you decide to purchase before midnight, April, 21st - YOU can enjoy all of these benefits, for just $899.... Only $299! APRIL BARGAIN BASEMENT OFFER: In order to introduce MORE PEOPLE to the range of Bradley Thompson products, this FULL COURSE, created for 2019, can be purchased RIGHT NOW FOR JUST $47 – and Get an INSTANT Download link right to your inbox..
We have NEVER offered this entire package at such a cheap price. There’s never been a better time to get started – both with this course, and in life coaching in general. 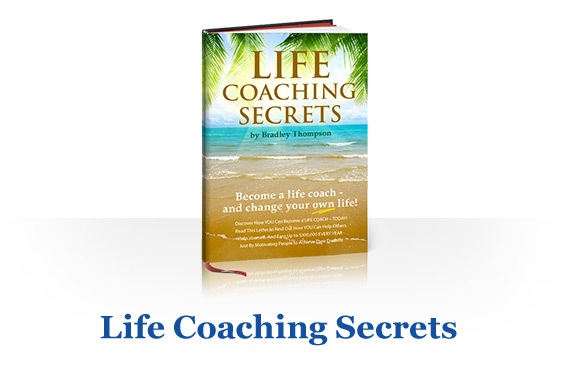 Life Coaching Secrets is distributed via Digital Download direct to your inbox. Written material is in PDF format. Audio is in MP3 format. - Michael Masterman, author of "Genius Mindset"
THRILLED, Let Us Know, And We’ll Refund EVERY PENNY! You’re going to do FANTASTIC THINGS as a LIFE COACH. You’ll not only help a LOT of people, you’ll also earn a huge amount of extra cash – to help fund your personal dreams and goals. But I want you to feel totally comfortable about parting with your dollars to try out the “Life Coaching Secrets” program. That’s why I’d like to give you an IRON-CLAD, NO QUESTIONS ASKED, ONE YEAR, RISK-FREE REFUND GUARANTEE! Here’s my promise: I GUARANTEE that you’ll not only find this the most empowering life coaching program on the PLANET, but that you’ll ALSO earn an ABSOLUTE MINIMUM of $150,000 in your FIRST YEAR of life coaching. Now that’s a pretty solid guarantee. And it’s backed by my publishers, the Self Development Network. So you can be SURE that your money is safe. Here’s EXACTLY What You’ll Receive Inside Your Course! So, are YOU ready to discover the world of life coaching? Remember, you’ll get to learn ALL the behind-the-scenes tricks that life coaches use to make BIG CHANGE in the lives of their clients – in just MINUTES. You’ll discover how you can develop this AMAZING SKILL – to help yourself, to help friends, and to help clients professionally. You’ll figure out how to add LIFE COACHING to your list of services, and earn up to $300,000 (or more!) every year – JUST by chatting on the phone (or face-to-face) for half-an-hour a week. This is the ultimate in life coach training! Three in-depth modules, sharing all of the industry secrets with you – taking you from “no idea” to “professional” in only three weeks, working just half-an-hour each day. PDF format. A jam-packed bonus guide, exposing high-level secrets from the life coaching world. Learn how to change someone’s state, switch their belief systems around, "deconstruct" their words, and more! Yes, you’ll receive a full, professional diploma on completing the course. Display it in your office or on your website – and prove your credentials. PDF format. Karl Moore, to help promote your business, or to assist your existing clients. You also receive the audio version for burning to CD and giving to clients. PDF / MP3 format. Your purchase is backed by a SOLID guarantee, and further backed by the Self Development Network. You will earn at least $150,000 in your first year of life coaching, just by following our techniques, or we’ll refund every penny (minus original S&H). Simply let us know! Got questions? Don’t worry, we’re here to help. We’ll provide you with a special link to get in touch with our support team around the clock. You couldn’t be in safer hands! And all of this for the current CRAZILY low price... of JUST $47. APRIL BONUS: FREE 25-Minute Life Coaching Q&A Bonus! Order TODAY and you'll receive a BONUS 25-minute Q&A audio session - containing answers to your most frequently asked life coaching questions! Can all clients be coached? How do you chose a niche? How much should you charge? All of these questions and more - ANSWERED. FREE! There has literally NEVER been a better time to get started with this package. Life coaching is a BOOMING industry. As a life coach, you’ll uncover the little-known techniques that can help change anyone’s life within just minutes. You’ll be able to help yourself, your friends – and, most importantly, your clients. You’ll discover how to go from “no knowledge at all” right through to “advanced life coaching professional” in just three weeks, in as little as half-an-hour a day. You’ll learn the TRUE SECRETS of shifting belief systems, changing state, and reprogramming for success. You’ll learn how to handle clients easily, how to attract more business than you can handle, and how to get massive publicity as a niche life coach. This course teaches EVERYTHING you need to know. It includes certification, bonus recordings, lifetime support, and more. It’ll show you how to get started in life coaching – and how to make up to $300,000 in your first year. $300,000... from a few half-hour telephone calls, working in your pyjamas. You MUST learn more about life coaching. Thank you for visiting this site today. PS. Life Coaching Secrets is EXCLUSIVE to this website! You can’t get it in stores, on eBay, or anywhere else online. You can ONLY buy it from this website – and for a very limited period, too. So get to it right away – click HERE to own your copy of the course! PPS. We’ve NEVER offered this course at SUCH a low price before! Yes, we’ve run special offers. But we’ve never had the entire package available for JUST $47. Get INSTANT access to your program via digital download TODAY. Click HERE to get started! PPPS. Remember, we GUARANTEE you’ll earn at least $150,000 in your first year. Okay, so maybe you aren’t just learning life coaching for the money. You want to help people. You want to discover the techniques. But these skills can earn you an easy $150k working part-time. People NEED life coaches. You can help them out, and earn big as a result. Click HERE to begin the journey! Home | Learn More | Affiliates | Contact Us | BUY NOW! IMPORTANT: READ OUR EARNINGS & INCOME DISCLAIMER.